While the Eight Amendment has now been removed from the Constitution, the current draft legislation to provide for termination of pregnancies in the State, is "not capable of guaranteeing universal access to abortion services", according to Galway Pro Choice. On Tuesday, Uachtarán na hÉireann Michael D Higgins signed in the 36th Amendment to the Constitution, officially removing the Eighth Amendment. However legislation is now required to deal with the issue of terminations, as people in crisis pregnancies are still in a situation where they have to travel, or could take pills ordered online. However, according to Galway Pro Choice, the proposed legislation for the provision of terminations, is tantamount to a "rolling back of what the Irish people have voted for". The group said this can be seen in the proposed legislation's dating of a woman’s last menstrual period - rather than conception or implantation - as the benchmark to measure the start of pregnancy. "This has the restrictive effect of reducing the relevant period of pregnancy by approximately two weeks," said GPC member Sophie McGlacken. "Under the current draft, many pregnant people would have only a few weeks, or in some cases days, in which to make their decision. Worryingly, some people who experience irregular menstrual cycles may not realise they are pregnant until almost 12 weeks from their last menstrual period." The group said the proposed legislation has "a significant lack of clarity" in terms of how abortion services will operate in practice, particularly in relation to the role of medical practitioners and how they will make decisions. It is also described as "especially menacing", the "residual criminalisation of doctors" and the retention of the 14 year jail sentence. "This may cause doctors to interpret the legislation conservatively and deny abortion care in some circumstances," Ms McGlacken said. The group also described as "problematic" the provision on fatal foetal abnormalities as it only includes cases where the medical condition in question is likely to lead to the death of the foetus within 28 days of birth. "In many cases of fatal anomaly it will be possible to predict death soon after birth, but not the time-frame within which it will occur, and cases where the foetus’ life expectancy after birth is longer than 28 days are clearly excluded," said Ms McGlacken. "This will result in the need for residual travel to the UK and other jurisdictions in order to access care." GPC also said the proposed legislation, instead of resulting in more ease of access to terminations, will result in a "considerable barrier to access" for victims of sexual violence, people in abusive situations, and to those living in rural areas. It further described the requirement of a three-day waiting period before terminating a pregnancy as "paternalistic"; and noted there was a lack of inclusivity for transgender and non-binary people. GPC is calling for the draft legislation to be amended so that it abides by the World Health Organisation definition of ‘health'; removes any residual criminalisation of abortion; replaces ‘woman’ with ‘pregnant person’ or ‘woman or pregnant person’ throughout; removes the three day waiting period; allows for abortion is available up to 12 weeks gestation; provide clinical guidelines to aid interpretation of the law and clarify how abortion services will operate; and introduce exclusion zones outside premises where abortion care is provided. GPC is also calling for the legislation to be made publicly available for scrutiny by the Oireachtas and amended if necessary before coming into force; and include a review clause requiring an independent, human-rights-oriented review of its operation within three years of its commencement. 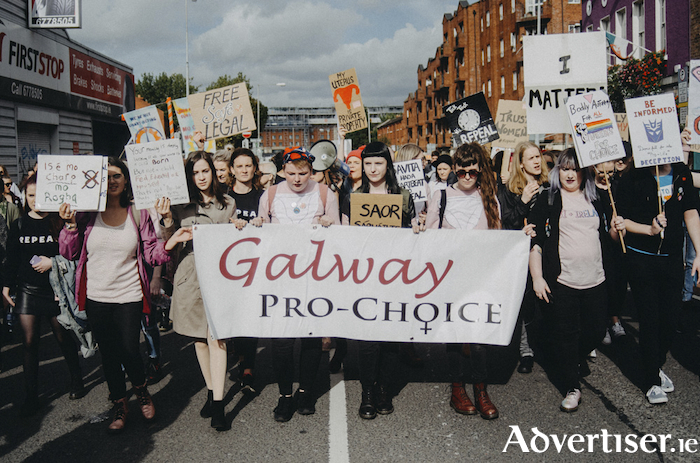 "On May 25th of this year, the Irish public voted overwhelmingly to remove the Eighth Amendment from the constitution," said Galway Pro-Choice member Jamie Canavan. "People born with uteri no longer need to be considered legally subservient incubators in the occurrence that they become pregnant. We have an opportunity to trust the people of Ireland to make decisions about their bodies which are best for their mental and physical well-being."